The You Are Here Festival, organized by Trouble (Sam Hillmer of Zs and Laura Paris) is a month long event happening at Secret Project Robot (we announced it here). 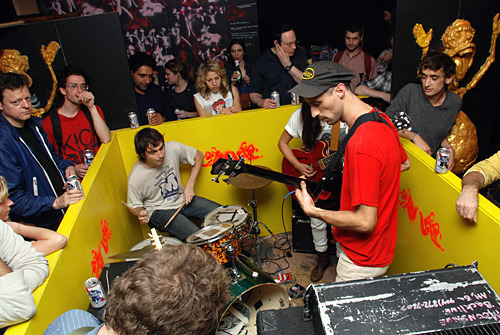 Trouble subverts the usual festival standards: instead of having audience members watch bands perform sets, audience members find the bands themselves. Literally: the event will be in a life sized maze that takes up the size of the venue. Its pretty “A'MAZING”!!! (Get it?) So how does one fund something so dizzying like this? By putting on a twelve-hour concert (and the obligatory Kickstarter, of course). This disorienting effort will feature sixteen performances, five DJs and three projectionists. It all goes down June 10th at LaSala in Brooklyn. Trouble packs a punch with its lineup showcasing a diverse grouping of performances. Megafortress’ airy, and bouncing waves will grace the stage, while Sam Hillmer will perform as Diamond Terrifier collaborating alongside drone mainstay Noveller. Expect something truly batshit, screeching and beautiful from those two. GDFX will also be there to tear it up- his recent Hai Fidelity mixtape on Soundcloud shows that he is in no ways of slowing down for 2012, continuing to mine his stew of ugly, gooey and pummeling beats. So, pack a five hour energy or two, cause it looks like June 10th might be a long day. More info can be found here, with set times below.